Twitvid launched in 2009, with the idea of becoming the “Twitpic of video sharing” on Twitter. But it’s gone through a bit of a pivot over the last year. Last December, the startup relaunched as a destination site where users can find videos shared by their friends. But it still had that legacy name to deal with. 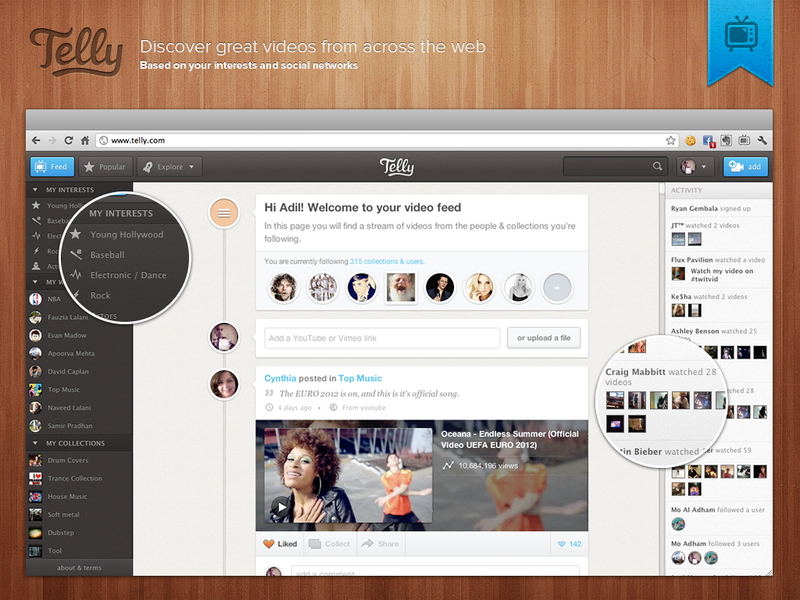 Well no more: Twitvid is rebranding as Telly, and relaunching its site to make social video discovery even easier. In addition to the videos uploaded by Twitvid’s users, visitors also have access to content from sites like YouTube and Vimeo, as well as CNN and ESPN. When users sign on to Telly, they pick interests and users that they’d like to follow, and then get a personalized feed of videos delivered to them. They can choose to add videos to their collection, share with other Telly community members and on social networks like Facebook and Twitter. There’s also a Telly Chrome extension and bookmarklet available to quickly add videos to their own collection. Finally, users can share their own personal videos on the service. Prior to the rebranding, Twitvid had been busy putting the pieces into place to enable it, in part by making a few acquisitions. In March, it acquired daily deals aggregator Frugalo and in May it acquired personalized music video service Cull.tv. In both cases, those deals were more about bringing smart folks on board, and it now has 17 employees altogether. For now, Telly is limited to its web interface, but CEO CEO Mo Al Adham told me to expect some apps to be released, including a Telly mobile and tablet applications. The goal is eventually to provide its social discovery across multiple devices, letting the user connect wherever they are.